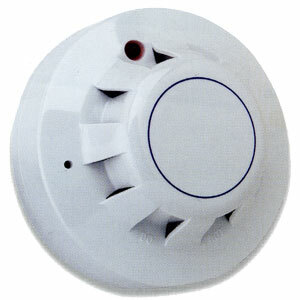 Optical smoke detectors incorporate a pulsing LED located in a chamber within the housing of the detector. The chamber is esigned to exclude light from any external source. At an angle to the LED is a photo-diode which normally does not register the column of light emitted by the LED. In the event of smoke from a fire entering the chamber, the light pulse from the LED will be scattered and hence registered by the photo-diode. If the photo-diode "sees" smoke on the two following pulses, the detector changes into the alarm state and the indicator LED lights up. The detector housing is identical to that of the ionisation detector but has an indicator LED which is clear in quiescent state but produces red light in alarm.